As per Hinduism, at the end of a cycle of creation the universe lay dissolved in the single primordial sea Ekarnava. Vishnu lies asleep upon the endless coils of Ananta Shesha – the thousand headed serpent. Then from the earwax of sleeping Vishnu appear two demons named Madhu and Kaitabha. Madhu and Kaitabha take food and energy from Ekarnava, which contains all the living matter in the universe. They grow up quickly and wonder about what made them, what is the source of the ocean in which they are residing, who are their father and mother etc. The demons then get a vision of Devi – the primordial mother. They realize that all birth happens with her blessings. The demons then meditate on the Devi. She appears before them and as boon the demons ask her that they should only die when they wish for death. The demons now roamed about fearless. During one of their excursions they come across an immense golden lotus and on it sat Lord Brahma in meditation. The demons were happy to see someone other than themselves and they challenged Brahma for a duel. Brahma was not ready to fight two demons that were 10 times bigger than Mount Meru. Brahma plunged down the stalk of the golden lotus and reached it source, the navel of Vishnu. Brahma attempted to wake up Vishnu but He was in his cosmic sleep and nothing could wake him up. Brahma then offers prayers to Goddess Devi and asks her to wake up Vishnu. It is believed that Vishnu goes into an inert form when Goddess Devi enters him in the form of Yoga Nidra. To help Brahma, Goddess Devi withdraws from Vishnu. Vishnu now wakes up and sees Brahma standing with folded hands before him. Brahma quickly narrates about the demons, Madhu and Kaitabha, who are chasing to kill him. Suddenly Madhu and Kaitabha arrive at the scene and challenge Brahma and Vishnu. Vishnu now fights both Madhu and Kaitabha. After the initial duel, Madhu steps away from the battle and Kaitabha fights alone. When Kaitabha is tired, Madhu steps in. Thus the two demons fight Mahavishnu turn by turn. 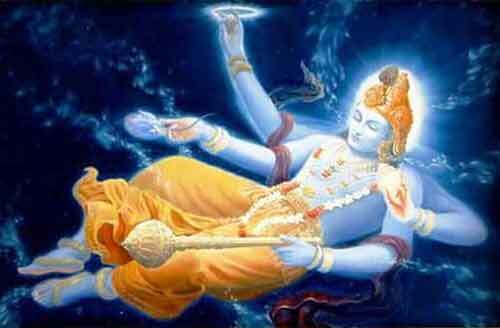 Vishnu then decides to take rest. The tired demons too take rest. Vishnu now meditates on Devi and come know about iccha mrityu boon given to the demons – to die only when they wished for death. Vishnu then worships Devi to find a solution to the problem. Devi appears before him and tells him that she will seduce them and this will provide Vishnu the opportunity to kill them. Madhu and Kaitabha soon start their battle with Vishnu. But suddenly Devi appears before the eyes of the demons. Her eyes create an atmosphere of lust. The demons are overpowered by lust. They had never gone through such an emotion. They stand enamored before her. Vishnu now tells the demons that he is impressed with their strength and they can ask any boon. The allure of beautiful Devi blinds the intelligence of the demons. They want to impress Devi so they hauntingly refuses the offer of Vishnu. To impress Devi, they tell him that they are more powerful than him and he can ask any boon he wanted from them. Vishnu immediately asks the demons the boon that they allow him to kill them. Devi immediately vanishes and the demons realize they had fallen into a trap. Now the demons remembered about the boon that Vishnu had offered. As boon, they ask Vishnu to kill them on solid ground. Demons knew that there was no dry place in the universe. Vishnu gave the boon and then expanded his thighs. The thighs were like an island on the sea of Ekarnava. The demons too expanded their body but it was no match to the thighs of Vishnu. Vishnu then killed the demons with his Sudarshana Chakra. The marrow of the demons flowed out and it later became earth. This is the reason why earth is also known as Medini. After each cycle of creation, this scene repeats. There is only one Single Source. The earwax demons are the untruth that we hear. We believe them and chase them. While chasing untruth we go far away from the Single original source (Supreme Truth – Vishnu). We then believe that there is a second. This causes our downfall. All the problems in the world are due to us not realizing that all animate and inanimate are Supreme Truth. The farther we are from truth – we are easily enamored by hatred, ego, jealousy, anger, desire and lust. As the demons moved far away from Vishnu, they are filled with fear of death. So they look for a solution. The boon of iccha mrityu – is the realization that we are all Supreme Truth. But we forget that all living beings are Supreme Truth. We cause harm to other living beings in numerous forms. When people are drunk with arrogance and power, there appears lust and anger to cause their downfall. The demons are finally killed – on thighs of Vishnu. From where did the demons appear first? From the ears of Vishnu. How far did they travel? To the thighs of Vishnu?